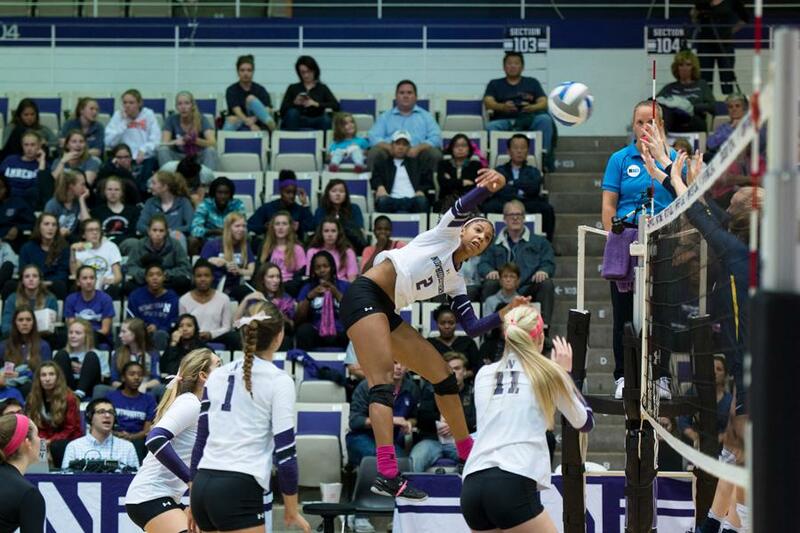 Symone Abbott swings for a kill. The senior is among a trio of players expected to lead the Wildcats this season. There’s no question that Northwestern struggled in Shane Davis’ first season as head coach. The Wildcats dropped their first eight Big Ten matches of the season, winning just one game in that span. In his second season, NU could be poised for a better season, but it’ll likely still struggle in the loaded Big Ten. There were a couple of highlights from the 2016 campaign that the Cats could build off going into 2017. Their first conference win came during a sweep of then-No. 24 Purdue, and later in the season NU nearly beat No. 3 Wisconsin, eventually falling in a five-set heartbreaker. NU will return arguably its three best players from last season, the only three seniors on its roster: outside hitter Symone Abbott, setter Taylor Tashima and middle blocker Gabrielle Hazen. Abbott finished last season fourth in the Big Ten in kills per set with 4.1, while Tashima finished 11th in assists per set with 9.0. In somewhat of a coup for the program, Davis secured the commitment of outside hitter Nia Robinson, the Gatorade Player of the Year from Indiana. Robinson could start across from Abbott to make up one of the more devastating outside hitter combinations in the Big Ten. There could be a lot of other new faces for the Cats, too. At libero, sophomore Sarah Johnson will fight to keep her starting job away from fellow sophomore Emily Ehman, freshman Amy Wang and freshman Lexi Pitsas. Sophomore outside hitter Allie Lindroth, who earned more playing time at the end of last season, could also see her role expanded in her second season. Davis will also need to find a replacement for middle blocker Maddie Slater, one of many seniors from last year’s team. Junior Rachael Fara could get the first crack at the job, with sophomore Olivia Viscuso and freshman Alana Walker, the daughter of former NBA champion Antoine Walker, also getting a chance. The opposite position will also be open for NU after the graduation of Sofia Lavin. The only opposite currently listed on the Cats’ roster is freshman Danyelle Williams, whose father, Aaron Williams, is also a former NBA player. Due to the renovations to Welsh-Ryan Arena, NU will play home games at Evanston Township High School this season. The Cats will face a particularly daunting stretch at the end of the season, facing Big Ten foes Minnesota, Wisconsin and Nebraska — which were the top three teams in the country in the final rankings last season — during a three-game homestand. NU’s season gets underway this weekend with games against South Florida, LSU and Arkansas-Pine Bluff at a tournament held in Tampa, Florida.